What do you guys have planned? I might be flying and driving to the grand canyon in april. Looks like a very fun trip. 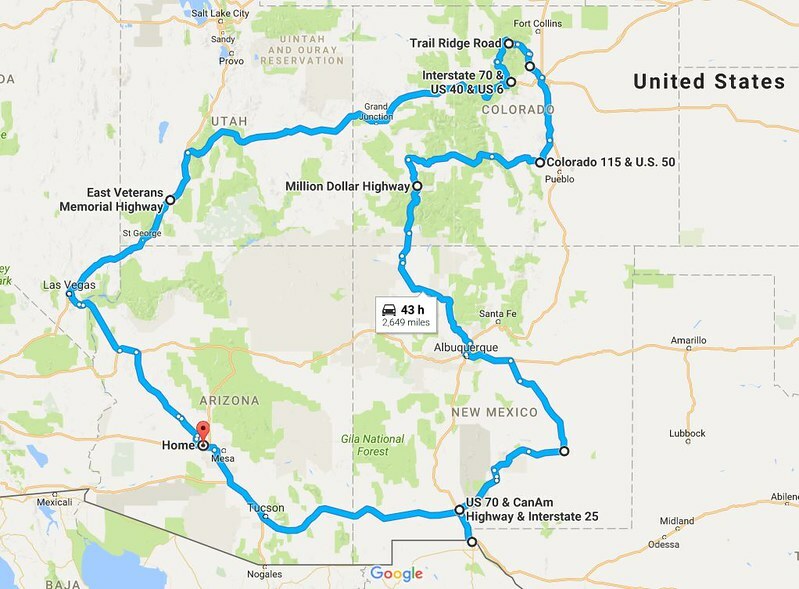 I'm planning a cross-country trip next August. Get down to Indianapolis some way, then I-70 > I-15 > I-10 > I-5 > I-90. Stopping at a few state high points along the way, visiting several national parks, and finally grabbing clinches of 70 and 90. For me, it depends on when and where meets are scheduled. I might try to take a non-meet-related journey out to finally visit North Dakota, because by then I should be recovered from my "was this ever boring" jaunt through Illinois that I took a couple of months ago. I might be up for another trip along I-74 and I-39 by then. Tail of the Dragon in August. Glad you are in a better money situation now. Another trip back to the New York Tri-State area for the Summer, probably June. As expected, it will involve another Wikipedia photography crusade, with visits to relatives, and friends of the family. So far this has been discussed, but nothing has been set in stone yet. Spring- Key West with my mom. Summer- Williston, ND for a family reunion with my dad. I will go to Saskatchewan and Manitoba if this happens. If you have some extra time when going through the St. George, UT area, I would recommend Snow Canyon State Park. My girl and I are most likely going on a trip in April or May. We're trying to tackle all the National Parks. This trip will take us to Great Smoky Mountains, Congaree in SC, and the three in south Florida. In summary, this is essentially a trip to the Florida Keys and back. Where would you fly to? My gf and I did this last April, what a coincidence! We flew to Las Vegas, and visited Zion, Bryce Canyon, Arches, and Petrified Forest before stopping at the south rim. The south rim of the Grand Canyon is much more fleshed-out with amenities, and be advised that the north rim doesn't open until mid-May each year. If you go to Arches, I highly recommend the Tapestry Arch all the way in the back of the park. It's a mile or so to hike to it, but it's worth it. Everyone crowds around the arches you can drive to, like the Delicate Arch featured on the Utah license plates. So the Tapestry Arch is far less crowded--plus the hike is fun and includes two other overlooked arches, one of which you hike straight through. I'm going to Raleigh, North Carolina and back for the day. I also have a NASCAR-themed trip where I'll stop in Martinsville, Virginia, then Charlotte, North Carolina, and finally in Darlington, South Carolina, and then I'll make a bonus stop to see my grandmother in the Myrtle Beach area. We had toyed with the idea of driving to Anaheim (CA) next summer, but we've nixed the idea. At this time, we have no road trip planned except our usual mission trip to México. Chicago is a possibility, but it's a remote possibility. 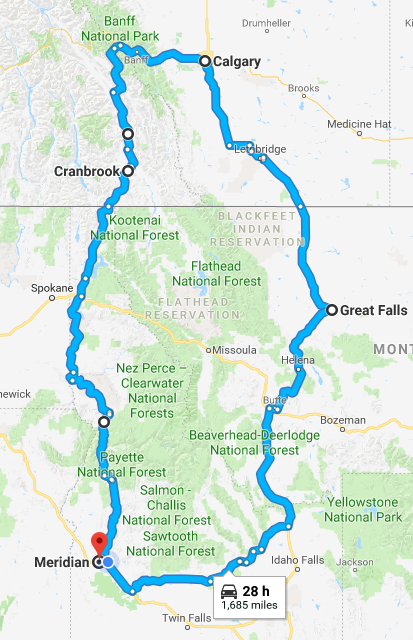 Primary purpose is a convention in Calgary, but I figured I might as well route along some scenic routes along the way (original plan was to go through Great Falls both ways, but this is more fun and actually less miles). Plan is one night in Cranbrook, 3 nights in Calgary, and 1 night in Great Falls. Won't really have time to stop and sightsee inside the parks (I'd like to do that another time though), but it should be a scenic drive, at least in the front half (the way back we'll just want to gun it through the easy roads and get back quickly). We’ve kicked around the idea of a golf trip to New Brunswick and PEI, but it’s far from certain. Planning on a trip to Florida (never been). Hitting up Charleston -> Savannah -> Jacksonville -> Tampa. On the way back I plan on clinching I-85 and visiting some extended family near Atlanta. Multiple trips from OKC to Cincinnati to visit family. If I can swing it later in the year, Atlanta is a possibility. Otherwise, I've got nothing planned. Wherever big storms and tornadoes pop, I'll likely be there. Early January (medium): to DC for TRB. Main purpose is the TRB Annual Meeting, so only a short portion of the trip will be roads. Pretty direct route down (though I plan to clinch NJ I-295 and a couple things in MD), but heading back, I'll be doing a lot of detouring to clinch in the Baltimore area and Delmarva. Visiting a couple museums in Baltimore and I should be able to finish Maryland's Interstates (only missing a few things right now). May do some more foot-clinching in DC proper if weather cooperates. I actually have a decent amount of DC's US routes clinched on foot right now. Spring Break (March, big): Shreveport for the meet. Ton of new mileage here and I'll be combining this with one of my other passions (hiking), as I'll be visiting 7 state high points on the way down and back. 5 new states planned (MS, AR, OK, TX, FL) and I intend to clinch US 13 on the way home, including my first trip over the CBBT. Late April (medium): Central PA for the meet. Will be taking a circuitous route out so I can visit the 5 PA counties I'm missing, will probably spend the day after the meet hiking at Ricketts Glen if weather cooperates. Yeah, it's boring, I know. But I'm a highpointer, and part of highpointing is visiting those boring flatland ones. Has to be more interesting than a couple of the flatland county ones in New York. I just read some of the Google reviews of Kansas' high point. So many of them are sarcastic, warning people about altitude sickness and such. The Kansas highpoint is badass - highly underrated. I wouldn't make a trip out of just going there, but if it's on the way within a couple hour detour, it's a worthwhile trip, if only because it contributes a little bit of interest and provides a reason to get off the interstate and out of the car in what is otherwise a ridiculously flat and abandoned part of the country. abandoned part of the country. Hey! That's where I grew up! And now you don't live there! What sort of high-elevation hiking have you done? I-70 has some excellent out-and-back hiking opportunities in the Colorado Rockies, accessible from rest area parking lots. But the best of them are the most strenuous.